^ "AUT campuses - AUT". www.aut.ac.nz. Retrieved 2017-08-09. ^ "City Campus' newest building now open - News - AUT". news.aut.ac.nz. Retrieved 2018-08-16. ^ "Contact - AUT Integrated Health - AUT". aih.aut.ac.nz. Retrieved 2017-08-16. ^ "AUT Centre for Refugee Education: What we do - AUT". www.aut.ac.nz. Retrieved 2017-08-10. ^ "AUT University | Pacific Media Centre". AUT. 2015-10-21. Archived from the original on 2012-07-20. Retrieved 2015-10-25. ^ "Pacific Media Centre // New Zealand Human Rights Commission". HRC. Archived from the original on 2 March 2012. Retrieved 2012-03-16. ^ "Pacific.scoop.co.nz". Pacific.scoop.co.nz. Retrieved 2012-03-16. ^ "New Zealand News". Scoop. 2012-03-12. Retrieved 2012-03-16. ^ "Books published by Pacific Media centre - Wheelers Books". Wheelers.co.nz. Retrieved 2012-03-16. ^ "David Robie - AUT University". Aut.ac.nz. Retrieved 2012-03-16. ^ "Pacific Media Watch | pacific media centre". Pacmediawatch.aut.ac.nz. Retrieved 2012-11-28. ^ "Asia-Pacific Network". Asiapac.org.fj. 2011-04-09. Retrieved 2012-11-28. ^ "Pacific Media Centre - profile". YouTube. Retrieved 2012-11-28. ^ "The University of the South Pacific". USP. Retrieved 2012-11-28. ^ "UTS: Australian Centre for Independent Journalism". Acij.uts.edu.au. 2012-11-09. Retrieved 2012-11-28. ^ "Organization: Pacific Media Watch". Wiserearth.org. Retrieved 2012-11-28. ^ "Pacific Media Watch". Pmw.c2o.org. Archived from the original on 13 November 2012. Retrieved 2012-11-28. ^ "DSpace at AUT University on the KAURI SERVER: Pacific Media Watch". Kauri.aut.ac.nz:8080. Archived from the original on 2008-09-28. Retrieved 2012-11-28. ^ "DSpace Community: Pacific Media Watch - Feedage - 10065809". Feedage. 2009-07-24. Archived from the original on 2012-07-29. Retrieved 2012-11-28. ^ "Pacific Media Watch | pacific media centre". Pmc.aut.ac.nz. Retrieved 2012-11-28. ^ "Communications and Information". Unesco.org.nz. 2009-07-16. Archived from the original on 8 February 2013. Retrieved 2012-11-28. ^ "pacific media centre | research: PJM1 - Pacific media freedom 2011: A status report". Pmc.aut.ac.nz. 2012-05-03. Retrieved 2012-11-28. ^ "Centre for Social Data Analytics - AUT". csda.aut.ac.nz. Retrieved 2018-09-10. 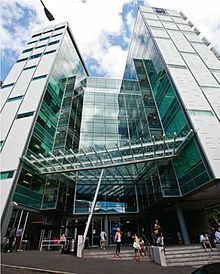 ^ "Auckland University of Technology (AUT)". Top Universities. 2015-07-16. Retrieved 2017-08-10. ^ "Auckland University of Technology". Times Higher Education (THE). Retrieved 2017-08-10. ^ a b "World rankings and accreditations - AUT". www.aut.ac.nz. Retrieved 2017-08-10. ^ "Rainbow (LGBTI) students: services and resources - AUT". www.aut.ac.nz. Retrieved 2017-08-10. ^ "your people at AUT. Declaration of the 2018 SRC President". AUTSA. Retrieved May 17, 2018.